Through the years from 2006 through 2012 Fauquier had a seven year streak of winning the District tournament. Losing the title last year by one team point, Fauquier worked hard to earn the wins to bring home the 2014 first place trophy once again. Focused and engaged wrestling which ran through this 2013-14 team. But it was not the district trophy anymore it’s a new one that reads the Conference 22 Champions on the trophy face as the Fauquier tradition continues. Round 1 - I can talk about past Fauquier wrestling teams but come on, it all about this year’s team that opens up building roofs. A lot can be said about the performance of this team and the first and second round of this 2014 Conference 22 tournament. I am going to start with round one as Fauquier went 5 and 1. That’s right; they only had six bouts in the first round and earned four pins along the way. This was a good start for the team as pins would aid in bonus points. But the gym roof held strong while spectators drew excitement with Fauquier team play. All other Falcons had first round byes and currently moved into the Semi-Finals. Semi Finals - With 12 of 13 Fauquier wrestlers advancing onto the Semi Finals many key match ups would ultimately decide the tournament. I can talk about how Daniel Ariola, Kyle Roche, Matt Raines, Garrett Tingen, and Clifford Harrison became the first inaugural Conference Champions for team Fauquier but going to wait as others would work hard on the mat to earn key wins as well. During this round the six pins came from Daniel Ariola, Jake Hilleary, Matt Raines, Garrett Tingen, Clifford Harrison, and Justin Sanker. Putting ten wrestlers into the Finals of the Conference 22 tournament could lead to the weaken mind as the head score table may have even suffered this as the Falcons where flying high near the roof tops. "What is the team score?" would be the talk of the tournament after the Semi-Finals. Even the host schools AD had to have a coaches meeting to discuss the breakdown of the tournament scoring as tournament stoppage would occur to discuss this issue. In my years of participating in this sport, coaching it, and now writing about it, I have never been witness to a tournament director informing coaches that they cannot process the correct score. Keeping the team score by hand is always a good idea regardless of who is hosting. But, it might have been the hair color of these Falcon birds which may have caused confusion among the host as it could be shocking to see at first. Jet blond, Oh yes! By this time the Falcons must had known all along how to escape the building with the 1st place trophy as it was just a matter of time. Now if you have not been a follower of Fauquier wrestling this season you may have been aware that this team is missing a 106lber. Coach Fisher may have been subject to giving other teams 6 points for a forfeit during dual matches as the same 13 wrestlers that weight in all season long will once again weigh in next week at Regions. Advancing the whole team to the Region event is a second big plus for the team. To do well at the next level it calls for a team effort and the more wrestlers entered in the event the more chances for more team points that you can earn. 3rd and 4th place round – I am not going to discuss the 5-6th rounds as Fauquier did not have any wrestlers in it as three would be battling for the third place consolation finals. Of the three Fauquier wrestlers Tyler Devers was the sole winner in this round as he took third place by winning by pin over Aaron Goode-King George. Tyler Devers went 2-1 with 2 pins for the day. The Finals - Conference 22 is the current alignment for team Fauquier as the post season first level event. So in some sense this was a chance to put your team name on the first place trophy in its first year of existence. To see team Fauquier wanting to grasp a hold of the first place trophy at day’s end was an experience that can only be played out with one team. Team had smiles on faces as they knew they had earned it. Coach Fisher prepared his team for this stage and as the curtains open up for the final round all wrestlers hungered to bring the trophy home. Of the 14 final bouts of the Finals, team Fauquier would be wrestling in 10 of them. Second place Eastern View would have 8 wrestlers as the head-to-head matches would have teams paired up six different times. But please understand that since you have the number one and number two ranked wrestling teams in the state of Virginia under one roof, you are going to have some excitement of kids displaying their “A” game. As team Fauquier went 5 and 5 in the finals many of the lost bouts where very close. A glance at them had (120) Jake Hilleary lost 6- 5, (160) Vito Camarca losing 3-0, (182) Andrew Smith lost 3-0, and Justin Sanker had an overtime 3-1 lost as the second place medals would be given to them. Much to say to all that worked hard to win the final match as your effort showed on the mat. 113 – As Daniel Ariola stepped on the mat as the first Fauquier wrestler to battle in the finals. Daniel put Douglas Palagios-Courtland in a pinning combination for the win as the team needed the extra points. Daniel had the lead and controlled the match leading up to his earned pin. 126 – A battle between two young and good wrestlers Kyle Roche and Bret Shurina of Eastern View would have both wrestlers exchanging points with a few lead changes in the match. Kyle Roche won 5-3 on a third period late takedown to win the match. As what Garrett Tingen did last year Kyle Roche becomes the sole freshmen to win the 2014 Conference tournament for team Fauquier. Winning this event as a freshman does not frequently occur. 138 – As the 132 matched ended within seconds you had Matt Raines getting his hand raised and earning a finals forfeit. The Chancellor Wrestler’s coach opted not to wrestle his wrestler as he suffered an injury during his Semi-Final match. This forfeit gave team Fauquier bonus points which is equal to a pin. I almost wonder if the tournament director would have started the finals on the 152 lbs weight class so the 145 bout would have been the final match-featuring the best wrestlers going head-to-head. But with the scoring issue it best that we did not present this idea. For myself I was not expecting to see the match to be over 1:45 seconds into the 1st period. A change of events that had both wrestlers tied-up looking to score a takedown right from the start. Tingen set-up a counter move to Jenkins offense which landed Jenkins on his back. The release of the air in the gym was exhaled by all with the referee (in on the call) slapping the mat for a pin-a moment that even had other team fans standing up clapping. The move was a basic cradle. Even an average wrestler knows this high powered pinning move as Tingen worked it perfectly. By far the best match of the tournament as both wrestlers will most likely be meeting each other again at Regions and States-that’s for sure. The road to the state title will have to go through both wrestlers. It is someone great to have the best two 145lbs wrestlers in the state coming out of the Conference 22. Anyone question that? 152 - Clifford Harrison won 8-5 over Kevin Willems from Eastern View and became the fifth champion for team Fauquier. Clifford did not wrestle Kevin during the season as Clifford battled Jenkins. But Coach Fisher noting that “this was one of Cliffords smartest matches in weeks” as Clifford had full control of the match right from the start. As Fauquier continues to battle through the bouts after the 152lb match the tournament by now was over as wrestlers still were wrestling hard to earn wins. To have team Fauquier have it back against the wall and lose to Eastern View in a dual meet just three weeks ago its seems the Fauquier is on track for a run at the state title. Q: So how does it feel to obtain the inaugural Conference 22 Team title. Coach Fisher - I am very excited for the guys. They did what needed to do to make it happen. The whole team contributed to the victory, and that is why we were able to have the lead going into the finals. Q: A team effort it was but any reflection of Garrett Tingen verses Austin Jenkins. Coach Fisher - Garrett did what Garrett does. He is looking to pin anyone from any position. Very few wrestlers are able to handle that kind of constant, unwavering pressure. 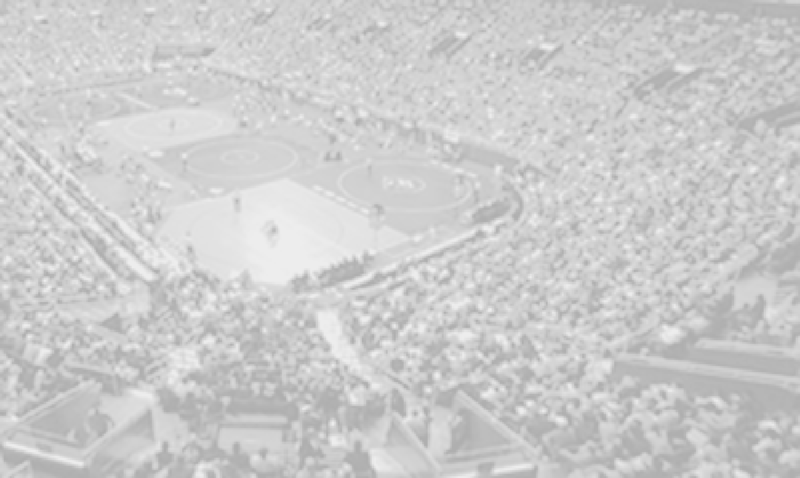 Q: Taking all 13 wrestlers to the Regional Tournament is important as all wrestlers are still alive with season play. How will this aid in team Fauquier being in the hunt for the Region title. Coach Fisher - We could not be coming into the Regional Tournament much hotter. We have a few guys that did not meet their conference goals, and we will continue to work with them this week, and make some adjustments. I feel like we are just starting to hit our stride. Q: Any thoughts with the teams having blond hair. Coach Fisher - I really like that the guys do it as a team, and it definitely provides some great team bonding, and you can’t argue with the results! The season will now move onto Regions and this event is slated for next Friday and Saturday. Team Fauquier will have five 1st seeds, five 2nd seeds, one 3rd and two 4th seeds. The top four winners of the Region will than advance onto the state meet. 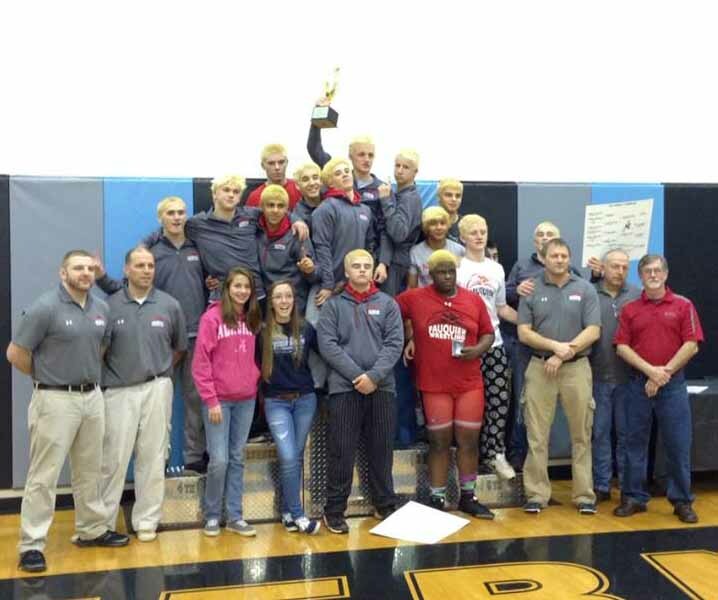 Last year team Fauquier only advanced four wrestlers. Coach Fisher knows that this year’s team is much improved from a year. Below are the results of Fauquier Falcons at the Conference 22 Tournament. Round Notes: Fauquier went 1 and 2. All three wrestlers are going to Regionals. Round Notes: Fauquier went 2-0. Round Notes: Fauquier went 10-2 with 6 pins. Round Notes: Fauquier went 5 and 1 with 4 pins and a Forfeit.